Artists take over an empty Victorian house in Penzance to create work and hold an exhibition over one weekend in September 2015. 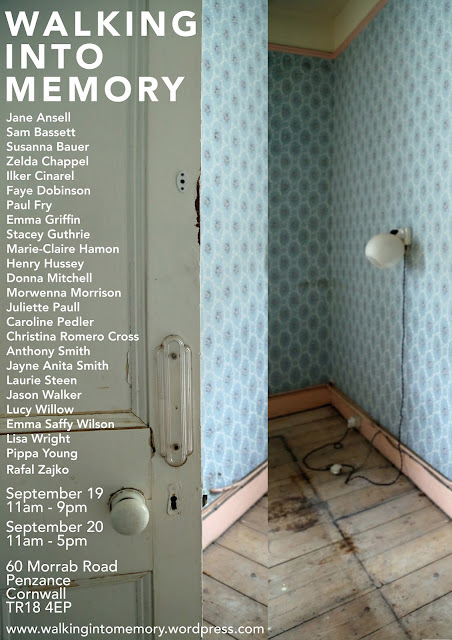 Walking into Memory is an artist-led project initiated by Jayne Anita Smith bringing together a diverse range of 24 artists from Cornwall and the wider UK, who will take over an empty Victorian house in Penzance to create art that responds to the traces of history and memory suggested within the fabric of the building. The house remained largely untouched since the 60’s and 70’s with many original features still intact and therefore generates a uniquely layered dialogue and a sense of times past – a historical space in transition. It provides the inspiration and opportunity for the participating artists to produce work away from their regular studio practice, a chance for exploration outside the usual gallery context. Paintings, drawings, sculpture, films and installations will be made both in situ and off site and come together to create a unique and transient show. The title Walking into Memory evokes wider connections involving memory such as trace, vestige, remains, remnant, relic, evocation, recollection, remembrance, home and belonging. Walking into Memory takes place prior to the house undergoing a substantial architectural renovation and therefore the artistic interventions and interpretations are destined to be absorbed into the memories and history of the house.